Former Vice President Joe Biden said on Monday that he thinks he is the "most qualified person" to be President of the United States. "I'll be as straight with you as I can. I think I'm the most qualified person in the country to be president," Biden said to an audience at the University of Montana. "The issues that we face as a country today are the issues that have been in my wheelhouse, that I've worked on my whole life." Biden, one of many Democrats considering a 2020 presidential run, said he would make a decision on whether to run in the next two months. He added his family will decide together if a presidential campaign is worthwhile. "I have two young grandchildren my son left, who love me and adore me and want me around. I want to be there to take care of them, so we've got to figure out whether or not this is something we can all do as a family," Biden said. "We're going to make that decision in the next six weeks to two months, and that's the basis of the decision." In 2016, Biden decided not to run in the Democratic primary in part because of his son's passing from cancer. Event moderator Bruce Feiler asked Biden which of his potential vulnerabilities scares him the most. "‘He's too old. He signed, he cosponsored the crime bill. He was the chairman of the judiciary committee during the Anita Hill hearings, and he's out of touch in the era of Me Too. $1.5 million ain't gonna cut it anymore, you need $100 million. Who wants to wake up at 6 a.m. for the next two years and get insults from the President of the United States? … You're a gaffe machine.' I could go on. Which of these scares you the most?" Feiler asked. "None of them," Biden said. "I am a gaffe machine, but my God what a wonderful thing compared to a guy who can't tell the truth. I'm ready to litigate all those things. The question is what kind of nation are we becoming? What are we going to do? Who are we?" Biden also talked about his 1988 presidential campaign where accusations of plagiarism plagued his campaign. 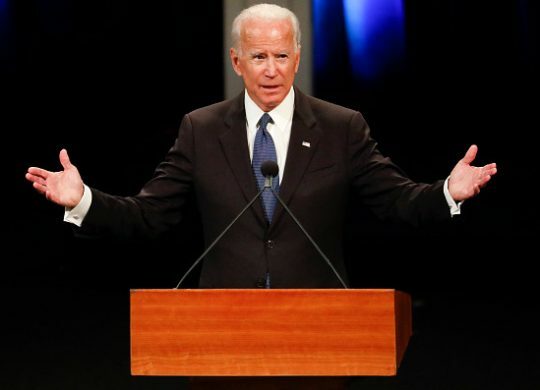 "It all came out in the wash — I never did plagiarize, I never did — and it all was proven that that never happened," Biden said. Although in 1987, Biden admitted to plagiarism.